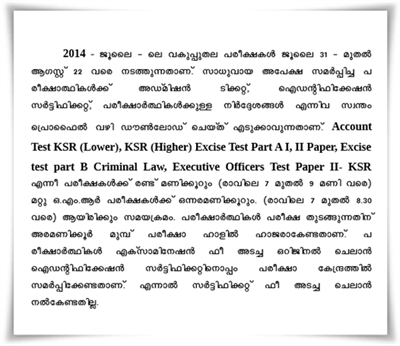 Kerala PSC departmental test July 2014 hall ticket download is now available at official website. Candidates who have applied for the exam can download the admission tickets through their one time registration profile from the Kerala PSC website. The exams will be held from 31st July – 22nd August at various centres in the state. The tests will be objective type (OMR valuation) except the tests for the IInd class Language Test in regional languages. The Kerala Public Service Commission (Kerala PSC), the largest recruiting agency has taken all initiatives to conduct the departmental test which is scheduled from 31st July – 22nd August 2014. Candidates who have applied for the exam can download the admission tickets through their one time registration profile from the Kerala PSC website. The tests will be objective type (OMR valuation) except the tests for the IInd class Language Test in regional languages. The exams will be held at 56 centres including Kavarathi Islands. The question papers can be answered by referring to the allowed text books prescribed in the respective subjects which are published by Government. Candidates are not allowed to use calculators, Mobile Phones and other electronic equipments inside the examination hall. The answer scripts of candidates will be liable to be invalidated for violation of instructions as per the notification from the PSC. It is very important that the candidates must have to produce the Identification Certificate and Admission Ticket duly attested by the Gazette officer. A two hour exam consisting of Account Test and Kerala Municipal test will be conducted on 31st July 2014. The Department test for the staff of KPSC will be held on 14th August. Applicants should have a thorough knowledge about the timetable and timing of the exams. As the exam schedule is being arranged for three weeks, the timetable must be downloaded and kept to have a well preparation on each subject. While inside the exam hall, candidates must take the responsibility of referring to the headlines on the question paper to get the knowledge about the test which they have applied and to write their Register Number on the top of the question paper booklets. As per the notification, the admission tickets of the Kerala Jail Subordinate Officers Test-II Paper and Kerala Jail Officers Test III Paper (practical test) will be issued separately. Candidates must reach the exam hall half an hour before the commencement of the examination to avoid last time hurry and scurry.